We’ll have a 30 minute call to get to know one another and prepare for your shoot. You’ll tell me about your pet and what you hope to gain from the session and I’ll explain what you can expect from your photography experience. Your one hour session will allow your pet to play, take breaks, and be at ease. We’ll get tons of great images that capture your pets personality and that you’ll love. We’ll sit down together for the photo reveal where I’ll show the magic we’ve created. You’ll be able to see and feel fine art samples and we’ll decide on stunning wall art pieces that will last a lifetime! The big day! I’ll personally deliver your art to you! I think you’ll fall in love with it and be excited to show it off! Your heirloom pieces will stay in the family for generations to come. Location within 30 minutes of San Diego city limits. Includes 2 pets. Additional pets/humans, $30 each. 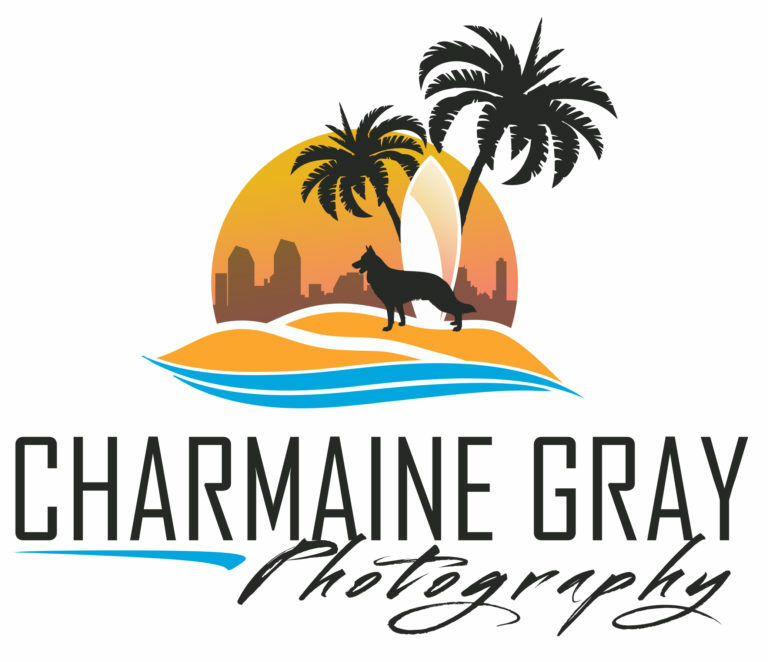 I met Charmaine when she began photographing dog surfing competitions and immediately found her to be personable and kind. I then discovered that she produced joyous and charming photographs of our dog and so many others. Her attention to detail and painstaking planning and organization is what enables her to do this. I do believe Charmaine puts the same love and care into photos of other people's dogs as she would if the dogs were her very own. I'm beyond pleased with the quality of her work and find her very accommodating and so easy to work with. Photos of our dogs are memories preserved and Charmaine's are treasures. Charmaine has been wonderful to work with. She was very flexible with our schedules and her photography is amazing. She asks what we want to do in the photo session, if we want to add bandanas or vests and her input is nice too with lots of good ideas. The photo packages are very nice too. We got more for our money than our previous photo shoot in Los Angeles. I am definitely going to contact her for our next photo shoot with our other dog. Charmaine was very easy to work with throughout the whole process. She worked well with my 2 dogs in order to capture really great shots. The photographs are really beautiful, with great lighting and were taken at a beautiful location, Charmaine recommended the place and time based on ensuring the best lighting for the photos. I would definitely recommend her. I already knew that by planning a dog fundraiser event for ARF(Angel's of Rawley Foundation) for Doggies on Deck at Landinis that I would be too distracted to take my own photos. I was so happy I hired Charmaine to be my photographer for the event, so that her talent could capture the magic and fun of that evening. I was so pleased, from the first email exchange and follow up phone call, Charmaine made sure every one of my expectations or needs was met throughout the entire process, especially when the photos were being processed/delivered. I have never been so pleased by the quality of someones work, the reveal of the images was so exciting. Charmaine is the best pet photographer, I would recommend her amazing work to anyone based on my experience of her professionalism, and passion to capture the best photos. I look forward to booking a private session with her in the near future.